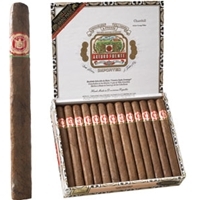 Arturo Fuente Churchill cigar is consists of the Fuente family's world-renowned Dominican filler and binder. This cigars superior construction provides a long and steady burn with an excellent draw and consistent flavor throughout. Every cigar must pass numerous quality inspections before it is boxed and sealed with the Fuente family's name.